Young people with the right skills make great employees. A graduate-style development programme will help you recruit and retain the very best young people. With one in four graduate employees likely to leave their employer within 12 months of joining, how sure can you be that your young employees will stay with you? lack of genuine interest in their development. lack of skills development and opportunities to utilise their skills, expertise and abilities. lack of recognition for the contribution they make. lack of career progression and promotion. Providing your young employees with a graduate-style development programme will help considerably with addressing these issues. It will decrease the likelihood that your young employees will resign in the early stages of their career and prevent the disruption and inconvenience that that can bring to your organisation. With only half of large employers and just 1 in 9 SMEs currently providing a graduate programme, you have a great opportunity to differentiate your organisation by offering a graduate-style development programme, and attract top calibre graduates. Bridge the gap between your young employees’ academic studies and the reality of the world of work. Rapidly integrate your young employees smoothly into their team and department, and benefit from their contribution quicker. Accelerate performance from new recruits, and make them more productive. Retain employees thereby avoiding massive costs in terms of both time and money: advertising for a replacement; sifting through mountains of CVs; interviewing, inducting and training. receive from their peers, manager and senior executives. It is critical that you engage your young employees in their first year on the job. See their self-confidence grow so they take more initiative in the workplace. Develop the ability to ask better, more critical questions of the people they meet. 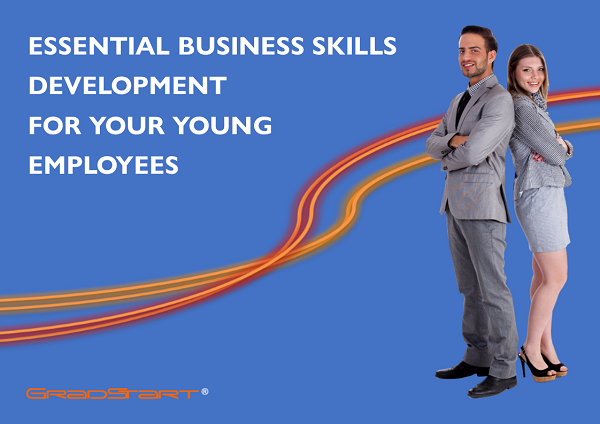 Develop essential skills that will form a solid foundation on which to build their career. Gain an understanding of leadership and how to lead. Increase career and promotion prospects, and experience greater responsibility and higher income. Once a month they’ll join with employees from other local and national employers on our training programme. This expands and extends their business knowledge and skills in a stimulating, thought-provoking, proactive environment that aids retention of knowledge and fosters new understanding, behaviour and performance. In between the monthly classroom-based sessions, they’ll be monitored and encouraged to apply and practice these skills, so that they quickly become even more competent and confident with these skills for the benefit of your business.